When you put your house on the market, your home's curb appeal will often make or break a sale before potential buyers even step through the front door. Here are five common curb appeal mistakes you should change before listing your home for sale. 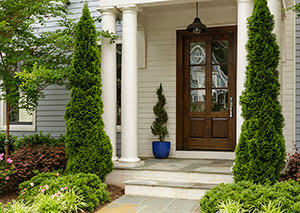 If your yard is overgrown, potential buyers will wonder what else you have neglected to maintain. Dying flowerbeds or unkept shrubs and trees won't make a good first impression. Keep the lawn mowed and trim back the shrubbery. Take some time to spruce up your landscaping, or, if you don't have a green thumb, pay a professional to do the job. It may seem like no big deal to you, but potential buyers will wonder why your car is parked in the driveway instead of in the garage. After all, if you don't have enough space to keep your car in the garage, then the house is probably lacking storage. Toys scattered by the front door or on the lawn also distract from the home's curb appeal. If your house stands out in your neighborhood because it's painted in overly bright colors, this will turn away a large percentage of potential buyers. To improve your home's curb appeal quickly, paint the exterior in a neutral color. If you need inspiration, it's a good idea to check out the colors of the homes immediately surrounding yours and then pick out colors that match. If your home's paint is peeling off or the shutters are loose, you need to get a maintenance crew to give your home a once-over before it goes on the market. Even if these issues are cosmetic rather than functional, buyers won't want to move into a house that will immediately require a lot of repairs. Unfortunately, the way your neighbors care for their property is likely to influence yours―after all, no one wants to live next door to an eyesore. If a nearby house is ruining your curb appeal because their grass is too high, you can offer to help your neighbor clean up the yard to improve your chances of a sale. If the house or yard is in utter disrepair, you can report it to the city.